Last November, a team of scientists announced the discovery in Greenland of a huge crater, larger than the city of Paris, buried under the ice in the area where the Hiawatha glacier is located. 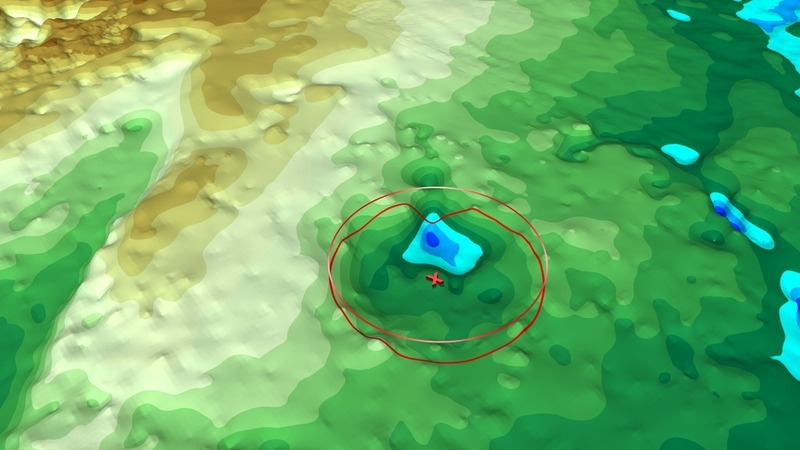 The huge hole, about 31 kilometers in diameter and about 300 meters deep, was detected by aircraft radars studying the thaw in this key area for the climate of the planet. Three months later, NASA has reported the discovery, also in Greenland, of what appears to be another crater hidden under a blanket of ice. It is even larger than the one detected in autumn because it measures 36 kilometers in diameter although it has less depth, according to EL MUNDO osep MacGregor, the glaciologist at the Goddard Space Center of NASA who has discovered it: " The new crater is a little more large but less deep (between 100 meters and 160 meters deep), suggesting that it has suffered erosion for a longer time. " If it is confirmed that it was formed by the fall of a meteorite, it would occupy 22nd place in the ranking of the largest craters found on Earth. Although scientists do not know for sure when it was formed, they have been able to estimate that the snow accumulated above is at least 79,000 years old . "We hope to get samples from both craters to confirm their nature but it is a long-term project, it takes years to drill the ice and reach them," the scientist said in an e-mail. The hole is covered by 1.7 km of ice, as they have specified. Both holes are quite close, separated by about 183 kilometers, although NASA geologists believe they are unlikely to have formed at the same time , according to an article published this week in the journal Geophysical Research Letters . Although they consider that it is most likely caused by the impact of a meteorite, they still can not completely rule out that it was the result of the sinking of a volcano's caldera. However, MacGregor rejects that hypothesis. "In our study, we present what we consider to be solid evidence that the structure was formed by an impact, and if it had been the collapse of a volcano's caldera, the geophysical data would have been different from what we have observed. there was a positive magnetic anomaly, instead of the negative anomaly we have observed, "explains MacGregor. On the other hand, the volcanic areas that are known in Greenland are hundreds of kilometers away. Before discovering the crater on the Hiawatha Glacier in November, scientists thought that most of the footprints at the poles would have been eroded by the erosion caused by the snow. But upon finding the first, MacGregor reviewed the topographic maps of Greenland to look for signs of possible craters. Examining frozen surface images taken by NASA's Aqua satellite instruments detected a circular structure about 180 kilometers south of the Hiawatha glacier. To confirm his suspicions, he analyzed the radar images taken by the aircraft of Operation IceBridge of NASA, in charge of monitoring the loss of ice at the poles. The researcher does not rule out that the ice of Antarctica, the other great region of ice of the planet, hide structures like these: "We have also made this type of overflights there and it is possible, even probable, that there are also craters under the ice and not we have found them yet. " Considering that "we have studied our planet in many ways, by land, air and from space," says MacGregor, it is "exciting that it is still possible to make discoveries like this ."